Cape Town - Low-cost airline FlySafair has partnered with consumer credit solutions provider, the RCS Group, to enable more South Africans take to the skies. FlySafair is the first South African travel brand to partner with RCS. The deal allows customers up to 55 days of credit interest-free and enables them to choose their own payment terms over 24 or 36 months. 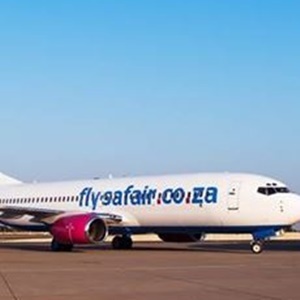 “We believe this is a solution which will enable markets which traditionally have been unable to afford air travel to begin flying, and we are extremely proud to be the SA carrier that pioneers this,” says Kirby Gordon, head of sales and distribution at FlySafair. According to Regan Adams, CEO of RCS, the company believes that offering this facility to its customers will ease the burden associated with travel costs - be it for business or leisure. Gordon explains that, though consumers are becoming increasingly aware that by booking flights early they can access the best deals, they don’t necessarily have the cash flow to pay for their ticket in advance. “People are busy saving, but as they are busy saving flight prices are going up because it’s getting close to departure. As a result, we’ve had a lot of people ask if they can provide a down payment to secure a flight,” he comments. While FlySafair has always accommodated clients who don’t have credit cards by accepting cash payment for flights through Pick n Pay, through this card they will have the option of making an advance purchase and paying it off over time. FlySafair has again been named the most on-time airline in the world by air travel intelligence specialist, OAG. The airline landed the number one spot with an average on-time performance (OTP) of 94.9% over the twelve month period from October 2016 to September 2017. OAG provides global flight information and holds an extensive network of global air travel data.